This edition of the Septuagint (LXX) Greek Old Testament was compiled by Alfred Rahlfs and revised by Robert Hanhart. Begun in the third century BC, the Septuagint is the oldest Greek translation of the Hebrew Old Testament. It is referred to as the LXX (Septuaginta) because it is believed to have originated with seventy Jewish scholars of Alexandria, who translated the Hebrew scriptures into the Koine Greek of their day. The oldest surviving codices of this translation are from the fourth century AD. 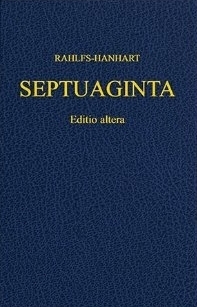 Since the text of Rahlf's Septuaginta relied mainly on Vaticanus (B), the Critical Apparatus provides information on alternate readings in Alexandrinus (A) and Sinaiticus (S). Hanhart's revision of the apparatus also added information on variants found in a select number of uncials and other rescensions. This resource is also available as the text of the LXX, the apparatus and parsings: LXX with apparatus and parsings.